The Eurovision Song Contest is the world's longest-running international televised song competition, having been broadcast every year since 1956. In 2011 Azerbaijan were named the winners of the contest, making them the host nation for the contest in 2012. Our award-winning work on Eurovision's visual identity in 2011 led to our being invited back to by Brainpool, the company producing Eurovision, to create the new identity for the Eurovision Song Contest Baku 2012. The Eurovision Song Contest is a competition held between the member countries of the European Broadcasting Union (EBU) that has been broadcast every year since its inauguration in 1956. Each year, the Eurovision Song Contest has a new and distinctive visual identity that reflects the host city and characterises the entire event, from the look and feel of the television coverage to the identity tags for the venue crew. Azerbaijan is a country that's rich with natural oil and gas deposits, which is why it's popularly referred to as 'The Land of Fire'. We took this nickname as our guiding inspiration in creating new Eurovision identity that is culturally specific to Azerbaijan, as well as having all of the dynamic energy that audiences around the world have come to expect from the Song Contest. We created a playful and celebratory visual identity that harnesses the heat and vibrancy of a smouldering fire pit. 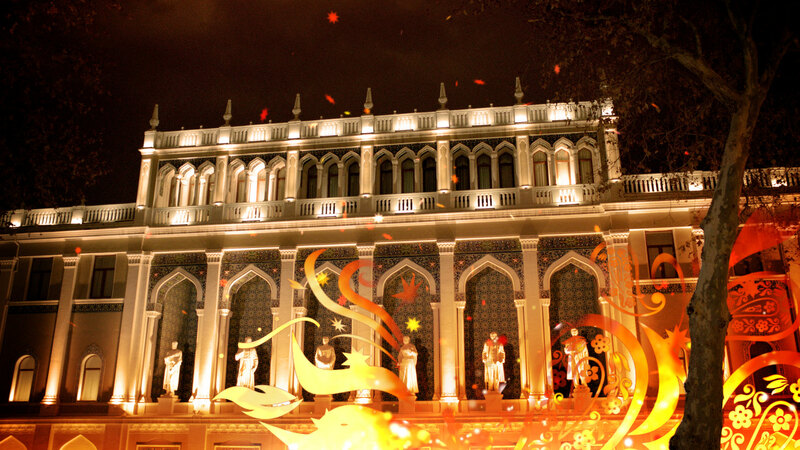 The central marque we designed is a flower made of flames, with lively dancing human forms hidden within its petals. Our new identity for Eurovision was applied across a wide array of brand collateral, including CD packaging, brochures, backstage passes and t-shirts to taxi-wraps, buses and building sized banners. We also produced all of the animated on-screen graphic assets that were used for broadcast, including the opening title sequence, stings, lower 3rd straps and a dynamic voting table.